The TF-2 was the first duckbill check valve introduced by Red Valve Company. The TF-2 was developed based on a United States EPA grant in the 1980’s to overcome excessive costs in maintenance and replacement of non-performing flap gates. 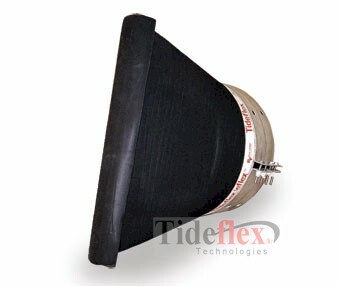 Hundreds of thousands of Tideflex have been installed since then providing reliable backflow prevention. The TF-2 design has been enhanced by the TF-1, flat-bottom, Duckbill Check Valve. The TF-1 requires minimal bottom clearance and the inherent geometry and construction of the TF-1 yields a stronger, more durable check valve. The original Tideflex design, the TF-2, has a flare on the top and bottom of the valve. It has been superseded by the TF-1 as Red Valve’s standard design, but remains available for customers who desire it for aesthetic reasons or space limitations. The TF-2 can also be installed on the OD of elliptical pipe and many arch pipes. Tideflex Technologies also offers a thimble plate option allowing the slip-on TF-2 to be installed directly to a headwall or seawall. For higher backpressure ratings or to lower headloss while maintaining backpressure ratings, the Saddle Support Technology (SST) can be used in conjunction with the Series TF-2.